We have a new dog. 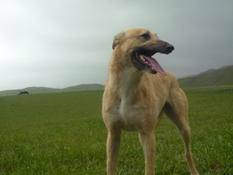 we were planning on getting a whippet puppy, but came home from a ten day break with a rescue dog, two year old lurcher. She is very sweet and pretty and clingy and will only toilet on the carpet, ha ha. above this is her sister, who is also very pretty and sweet. I know the feeling - I went to the pound to collect Remington's brother and came home with R, described to me as the more 'intelligent, naughty and dominant' of the two brothers. And they were right. I'm sure your lurcher will learn not to ruin the carpets - our two were dreadful when we first got them (R chewed his way through a new window frame) but they settled down. I hope yours does. She has lovely eyes, and I love her beard! do you have lurchers too? She only poos on the carpet now if the scary cats are in the garden, blocking her path. She is all big brown eyes with a sneeky greedy streak. spoilt is a word I might use. Runs like the wind in a slightly unco manner.